Jeff Tweedy's WARM is out now via dBpm Records. Jeff Tweedy, frontman for Chicago's beloved Wilco, has released his first solo album of original music. WARM, out now, is a stripped-down version of Tweedy's signature alt-rock sound. The 11-track album goes from bright to dark and all shades in between. Tweedy tackles stories of his troubled childhood in Belleville, Ill., soundtracks his own struggles with drug addiction and delivers it all with twang and the appropriate dash of practical humor. Earlier this month, Tweedy also released his memoir, Let's Go (So We Can Get Back) A Memoir of Recording and Discording with Wilco, Etc., which he wrote at the same time as creating WARM. Tweedy says working in two different mediums in tandem forced him to tell his stories clearly "as opposed to coloring in around the edges." Tweedy spoke with NPR's Scott Simon about using music to cope, appreciating the exercise of prose writing and more. Hear their conversation at the audio link. I think when naming the record WARM... [I'm] not necessarily hoping someone will come to it and warm up to it, but I think it was more trying to communicate that there's some warmth to the record that I'm trying to connect them to from myself. Reaching out a little bit more explicitly than I have on a lot of my work. Just trying to find something recognizable and universal in the particulars of my specific time on this planet, I suppose. That image [of seeing my twin] appears in a couple of songs on the record. To me, it kind of represents this shadow self that we all have, I believe we all have, that we tend to dismiss and ignore. And I'm convinced that the more we're able to acknowledge some of our base, or instincts, and the parts of ourselves that we don't like as much, I feel like being able to acknowledge that and work on that is a recipe for maybe a happier life. I'm fascinated with the idea that there's a shadow self that is actually the part that you should be a little bit more concerned about keeping an eye on. I feel like I really was very fortunate to have found music to be such a consolation and a sustaining kind of thread through my life that has, in the parlance of maybe having had a little bit too much therapy, it's a conflict-free zone of some sort. 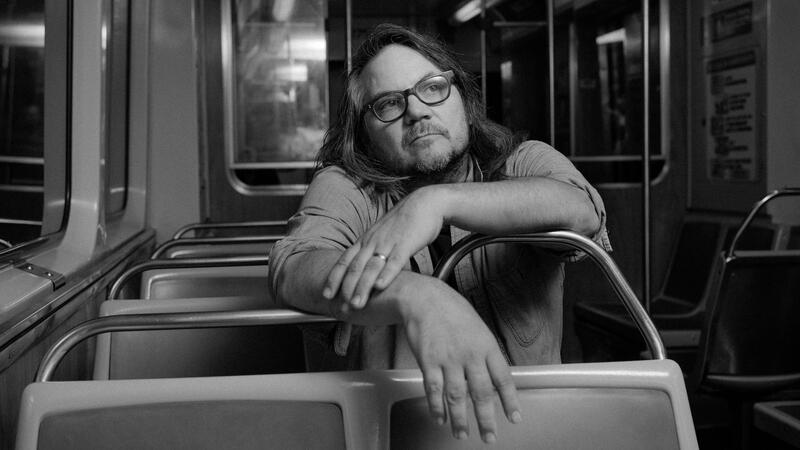 Jeff Tweedy, frontman of the band Wilco, is out with his first original solo album. Out yesterday is "WARM," and it features a stripped-down version of his alt-rock sound. JEFF TWEEDY: (Singing) I leave behind a trail of songs from the darkest gloom to the brightest sun. SIMON: The album goes from dark to bright and all shades between. Jeff Tweedy sings about his tough and interesting life from his troubled family growing up in Belleville, Ill., to his own struggles with drug addiction. He's also released a memoir earlier this month, "Let's Go (So We Can Get Back): A Memoir Of Recording And Discording With Wilco, Etc." Jeff Tweedy joins us from his recording studios in Chicago. Thanks so much for being with us. TWEEDY: Oh, thanks for having me, my pleasure. SIMON: So what's it like to do a book and an album at the same time? TWEEDY: Well, I think I was really, you know, kind of forcing myself to confront telling stories clearly as opposed to kind of coloring in around the edges of a story sort of abstractly to kind of create some sort of image that someone else can fill in, which is what I think lyric writing and poetry is generally. So there's a lot more precision to prose writing than I'm used to. SIMON: Well, let's listen to a little bit of the title track, "Warm." TWEEDY: (Singing) Please take my advice. Worry into your song. Grow away from your anger. Distance belongs. SIMON: What do you hope people will warm to in this album? TWEEDY: (Laughter) I think - I don't know. And I think when naming the record "WARM" not necessarily hoping someone will come to it and warm up to it, but I think it was more trying to communicate that there's some warmth to the record that I'm trying to connect them to from myself, reaching out a little bit more explicitly than I have on a lot of my work. SIMON: Reaching out with bits of your life, with things they can share. TWEEDY: (Laughter) Well, just trying to find something recognizable and universal in the particulars of my specific time on this planet, I suppose. TWEEDY: (Singing) From outer space, I am you. At distances, you're me too. SIMON: I understand you recently lost your father. SIMON: And I think it's fair to say you had a troubled relationship. TWEEDY: But troubled implies that we had an adversarial relationship, which wasn't the case at all. My dad and I really got along (laughter) for most of my life except that he was a little bit more distant from myself as a young person than I think a father should be. And, you know, I was fortunate to really get a chance to connect with him on a deeper level towards the end of his life. So that's what's been fresh in my mind, and I kind of related that in the book more than my relationship with my mother, which would have been the more dominant relationship in my life up until a few years ago. SIMON: Yeah. Well - and that's an entirely different relationship. TWEEDY: Yeah. I was more of a companion for my mother. I was a mama's boy. I think she maneuvered herself to be maybe a tiny bit in the way of whatever bonding might have formed with my father because there was such tension between the two of them also. I think I was built to be an ally (laughter). SIMON: That's a good way of saying it, yeah. Well, let's hear another track. SIMON: This is "Some Birds." TWEEDY: (Singing) In my window, I have a twin. I look out. He looks in. He has a point. I applaud. My goodness, my God. SIMON: That's a very powerful lyric - in my window, I have a twin. I look out. He looks in. TWEEDY: Yeah. That image appears in a couple of songs on the record. TWEEDY: (Singing) From my window, I have a twin. I'm always looking out, and he's always looking in. To me, it kind of represents this shadow self that we all have - I believe we all have - that we tend to dismiss and ignore. And I'm convinced that the more we're able to acknowledge some of our baser instincts and our - I don't know - the parts of ourselves that we don't like as much, I feel like being able to acknowledge that and work on that is a recipe for maybe a happier life. I'm fascinated with the idea that there's a shadow self that you - is actually the part that you should be a little bit more concerned about keeping an eye on. TWEEDY: (Singing) I can't find the plot. Something else is taking shape. I know it's a lie when you say it's OK.
SIMON: Has music - I mean, you talk in in your memoir very movingly about the fact that there are bits of your life - what I think you called your time on this planet - that you just don't remember in part because you had problems not dissimilar from your father's. Has music been a way for you to find yourself and find a purpose in life? TWEEDY: From very early on, I feel like I really was very fortunate to have found music to be such a consolation and a sustaining kind of thread through my life that has in the parlance of, like, maybe having had a little bit too much therapy, it's a conflict-free zone of some sort. So to answer your question, yeah, I don't know where I'd be without that for sure. SIMON: Jeff Tweedy - his new album is "WARM" - thank you so much for being with us. TWEEDY: Thank you for having me. TWEEDY: (Singing) Oh, I was naive. My shoes were untied. In heaven, everything is just fine. Transcript provided by NPR, Copyright NPR.